In my game of The Sims 4, there’s an NPC named Bruce Biggs. I first met him as he wandered over to a park bench, shirtless, wearing basketball shorts and a luchador mask. He promptly fell asleep. The Sims is a bizarre, unpredictable game, and the randomly generated outfits for townies are often weird as hell, but I’d never seen one quite like this. Usually when random sims are out and about they have a shirt on, at least. I decided to make my sim wake him up. Bruce Biggs was “very angry.” Given the circumstances, his mood is understandable. After talking to him for a few moments, my sim calmed him down somewhat. But I still had a million questions. What is your job, Bruce Biggs? What are you like? Who hurt you, Bruce Biggs? 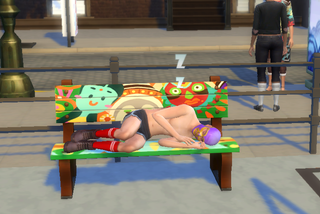 Do you often sleep on park benches? If that’s the case I am genuinely sorry for you. Yes, that is Bruce Biggs. I checked multiple times. I’m glad that he had a chance to clean himself up, or perhaps steal someone else’s skin? Maybe Bruce Biggs in the midst of laundry day and got locked out of his apartment. Maybe Bruce Biggs is a wrestling themed vigilante and I interrupted his post patrol nap. Maybe Bruce Biggs is in some kind of fight club, and I caught him taking a little snooze after getting punched by other sims. Even if I marry this sim and make him move into my house, I will literally never know. Hell, I might make my sim marry this guy, even though she has a fiancee. I love Bruce Biggs. I love his whole weird deal. The Sims is a special game because it allows for a multitude of possibilities to create narratives and build human stories. It allows you to explore romance, loss, or even let you make Drake and Nicki Minaj date. But what’s most wonderful about The Sims rests in the eternal mystery of a sim like Bruce Biggs—sometimes luchador, sometimes rastafarian. God bless you Bruce Biggs. May you succeed in all your endeavors, whatever they may be.